If you say William and Sprigg to most Cape Girardeans, they’ll probably say they think of St. Mary’s Cathedral. After all, that’s the biggest landmark around there. Lila and I were married in the church in 1969. You can see my deer-in-the-headlights look here. Wonder how many trucks have hit this? Churches, smurches. My interests run in other directions. 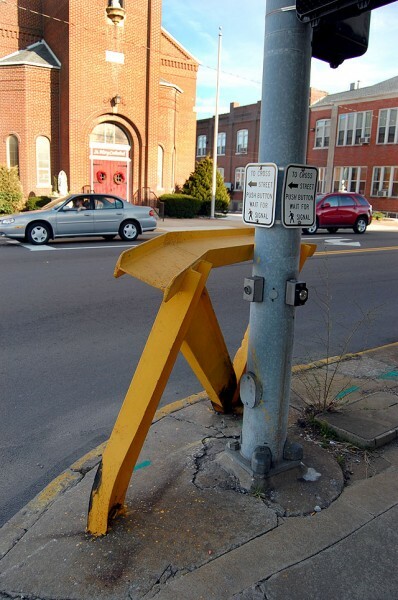 I’ve always been fascinated by this I-beam bumper that protected the traffic signal on the corner. It and the other posts have been scuffed and bent by decades of 18-wheelers having “Oh, bleep!” moments when they cut the turn too short. When you look at all the dents and scuffs, you can figure out why so many trucks crossing the Mississippi River Bridge used to slap mirrors. Some of those drivers may have had depth perception problems. The owner’s daughter was in some of my classes, but I don’t recall her first name nor if we were in Trinity Lutheran School or in Central. 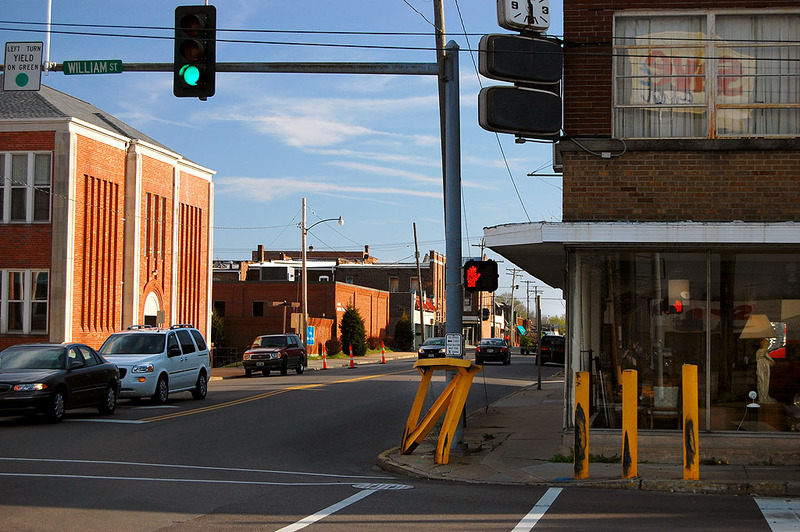 The building houses an antique store now, but it was hard to tell if it was still open or not. Did you buy a TV at Lorberg’s? If you bought a television set in the middle 50s, there was a pretty good chance that it came from Lorberg’s. The early sets came with a black ceramic panther with eyes that lit up. Mother thought they looked tacky, as I recall, so I think it was traded for something else or for a discount. I’ll have to ask Niece Laurie what that thing would be worth today in her antique shop. The photo I shot of JFK’s funeral was probably taken on our original set. The looks of the neighborhood is changing with new construction going on at St. Mary’s Cathedral School. It’s nice to see some life coming back to Sprigg and William. Wow, Ken! Back-to-back neighborhood entries. I spent a lot of my childhood in this part of town – my family owned Hirsch’s Thriftway. 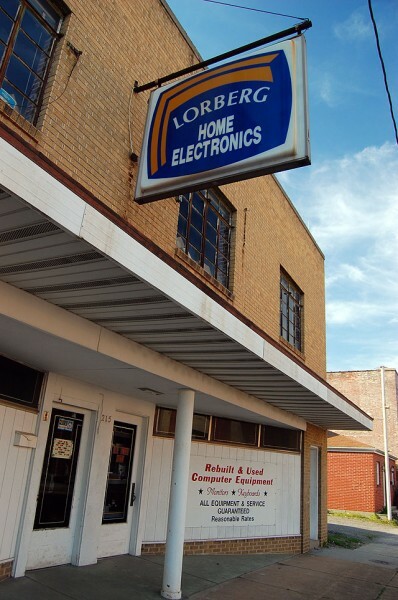 My folks always took electronics to Lorberg’s to have them fixed (back when you did that sort of thing with a television set), and of course we did our banking at Farmers and Merchants. Wish I could remember the name of the diner on the north side of Good Hope, and I think there was a men’s clothing store on the corner of Sprigg and Good Hope when I was a little girl. It was across the street from Cape Cut Rate. My mom’s grandparents lived in the yellow frame house next door to Lorberg’s, and she remembers when Lorberg’s burned, they had to hose down her g-parents roof to keep it from catching. I’m not through with this neighborhood yet, by a long shot. Keep watching. The clothing store you’re thinking of was Schade’s. I don’t remember Leo’s that Stephen mentioned, at least by that name. Was the diner on Sprigg Street called Covingston? I love the wedding picture . . . you two are mere babes! I worked at the Farmers and Merchants Bank in 1963-1964 so that area was very familiar to me. Jerry and I lived in the 800 block of William Street after we were married and I would walk to work from there. Long ago and far away . . . The thing I remember about the intersection of Sprigg and Williams from when I was a kid (1950’s) was on Sunday mornings there was always a paper boy on the northeast corner of the intersection selling weekend editions of the St. Louis Post and St. Louis Globe Democrat. He took advantage of the Sunday morning church goers at St. Mary’s and apparently did a great business. We usually bought the “Sunday papers” there or from the paper boy who had the corner of Northwest Blvd and Broadway. The “funny pages” were the best parts of the papers to me at that age. I think we usually snagged ours from the paperboy near Capaha Park. He had a wooden cart with steel wheels. It might have been the same kid as you described, except I thought he was closer to the Perry side of the park. I think my husband had that newspaper corner on Broadway and West end Blvd. The fish restaurant was Kohfields but they may have called it soemthing else. That was a booming neighborhood and it is so sad to see it now….. The establishment you are referring to was Al’s Midtown Lounge. My grandparents, Albert and Lenita Buchheit were the original owners. They move to that location from the bar located next to the Corner Bar at the corner of Independence and Frederick. The bar in the place on Good Hope was carried from the old place, because my grandfather did not want to have to cut in order to move it. They sold the business to Ed Kohfield and family, but they continued to work there into the late 70’s to early 80’s. My sister and I had our first jobs at waitresses there. Boy does that bring back memories, and i don’t mean the good kind either. we moved to cape from Pine Bluff, Ar. when i was in the 5th grade, where i attended a private girls school. the 5th to the 8th grade was hell for a little girl who had her own opinions. I got kicked out of the 8th grade, religious differences with mother superior(lol), for about 10 minutes, till my dad hit the front door. Central and its lack of catacism was a blessing for me. Keep it up Ken, no Alzheimers for me. 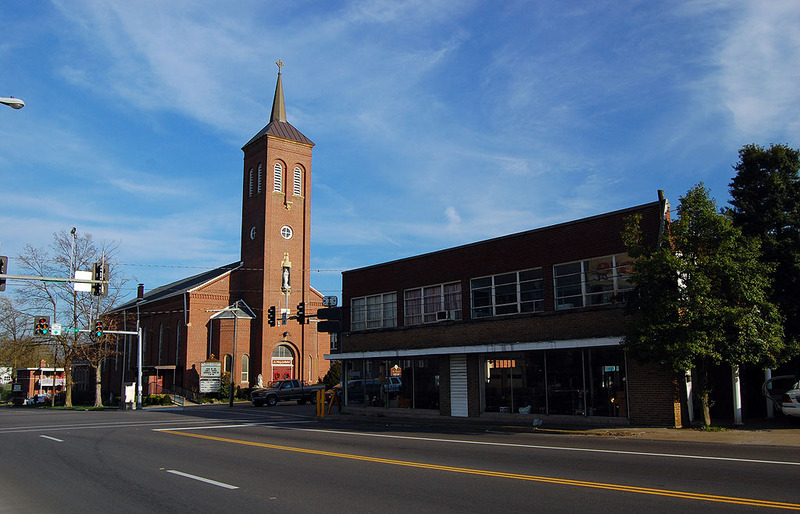 A tip of the hat to Bishop, later Cardinal, Bernard Law who held sway at the St. Mary’s corner for a few years (perhaps the steel X across the street has some religious significance) before leaving for infamy in Boston. He heeded the pleas of Protestant beaus gathered at the cathedral’s rear on Christmas Eve, and kept the Midnight Mass to a reasonable length. those steel wheel carts with the sunday paper was something else. I used one for almost three years around five hrs on a sunday morning taken the paper out bloomfield rd to the koch sub divison. after the morning rt. you could hear the wheels for a day or so. I think they used steel wheels so the people could hear you coming down the street from a distance. it would have been quit with rubber tires. Never thought of the steel wheels as being a marketing tool, but that makes sense. Al’s Midtown! I do remember Al’s. But I think the diner (c. 1965-68 or so) was called something else – or maybe when the diner closed/changed hands it became Al’s? I should ask my mom…she remembers everything like that! In the very early morning, a guy would go down the middle of the street with the cart, yelling ‘Post and Globe’ over and over again. Haven’t thought about that in years. Here I go testifying either to my magnificent memory for trivial events in my life or my age! When I was very, very young, my brother Ed who is about 6 or 7 years my senior sold Sunday Papers from a 3 wheeled, wood cart. His route or spot he sold from was around the college & one particular Sunday there was a heavy snow & Mom & Dad became concerned about him making it up the hill with the cart. I went with Dad & Mom to pick him up …you could barely make him out struggling to come down the steep hill in the white out conditions & heavy snow cover! I imagine the wheels were steel,the carts made a racket…hadn’t thought of that in years! Love the wedding photo…my husband Bill & I were also married at St. Mary’s Cathedral, 9/29 to years previous to you all…Father Bill Huggins. 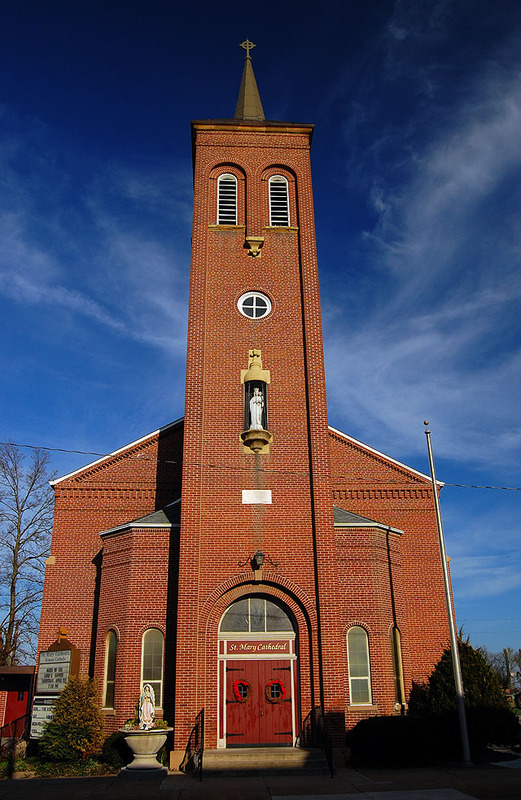 St. Mary’s was my Mom’s family’s home church, her adoptive parents Herman & Rose Pape…they had one birth son, Charles that was 16 years her elder. I have a long photo of a church celebration when Charles was in grade school. Lorberg’s is still there & he is still working on TV’s …my son in law took their less than 2 year old flat screen there last year & he had a blank screen operating in no time flat…he is an electronic genius…used to make house calls for my Mom when I was in high school. He fixes things old & new & very economically. Joe Lorberg is one of a kind & definitely one of Cape’s greatest assets & his shop a landmark! Opps, typo…Joe Lorberg is how his name is spelled. Sorry. 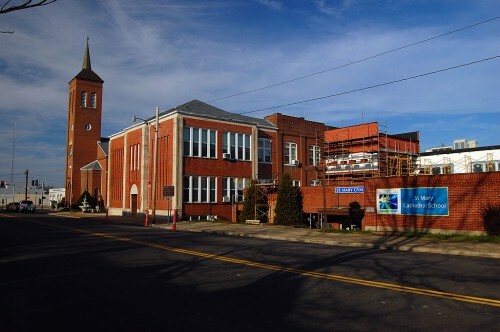 I attended St. Marys grade school in the 60s.Was an alter boy at church for mass many time.My ol buddy Bill (Sonny)Eason sold papers on the northeast corner from probly 66 to 69 or 70. that fellow sure did rough it on many a cold day. Al’s Midtown was originally owned by Al bucheit. Years later he sold it to Ed Kohlfeld. They were not brothers. Ed was Leo’s brother. I worked for Ed at Al’s Midtown when I was in high school. Great catfish, and Ed made the Kettle beef himself every week for the Wednesday special. It’s wonderful seeing all of the photos and hearing the many memories that you share. My family , Spann’s, are from this area and I’m so happy to see an hear the history . Thank you.